So last weekend was my first big one of the season being the first one in Italy. The race was called Montecassiano. The race was set to be 165KM starting off with 6 smaller laps of around 10KM each which would finish on a 1KM or so climb up into Montecassiano (the finish town) then it would go onto 5 bigger laps which would also include the smaller circuits but with the added loop of a similar distance also with a steep 1KM climb into the town (so the course was a figure of 8 shape). The neutral started, sketchy as expected, once the flag dropped it was a fast start as the race got underway. The pace then settled down a few attacks went on the smaller laps but were all reeled in, the most significant break including team mate, Nick. We then made the transition onto the bigger laps, the race had already started to whittle down the bunch lap by lap but now it was quicker as there was now another climb which was fairly steep. Coming into the second lap I took a bottle which then caused me to have a tangle and have a quick lie down on the floor. I was quickly able to get back up and off after finding my Garmin haha! Unfortunately this broke my shoe dial so after getting back onto the bunch I had to go back to the cars where Calum had some tape for me to do a mid race fix…. was pretty impressed with this one ;). I then got back into the bunch and moved back up before the next climb. Lap by lap the race was getting whittled down until on the final lap the bunch only contained around 40 riders. This is where it then began to split up with some groups splintering off the front. Coming into the final climb the pace was kept on with me starting to cramp in my left hamstring, with the legs still feeling pretty good I managed to get round a fair few to finish in 21st. A good way to kick off the racing here in Italy. I was pretty pleased with the result considering the bad luck with the crash. Onto the next one! Thanks to Pedal Potential for the support. So ....... just an update as to where I’ve got to so far. 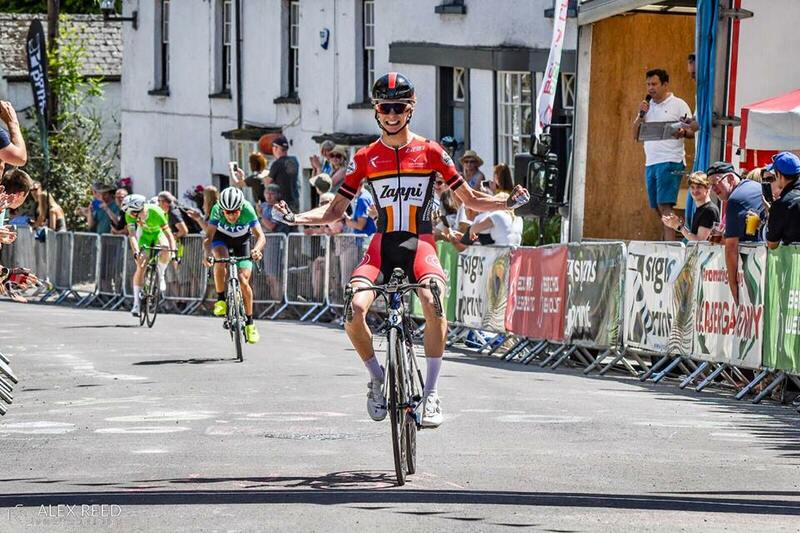 So the season ended with the final 3 races being the Junior Tour of Wales. Trophio Buffoni and the World Championships in Austria. 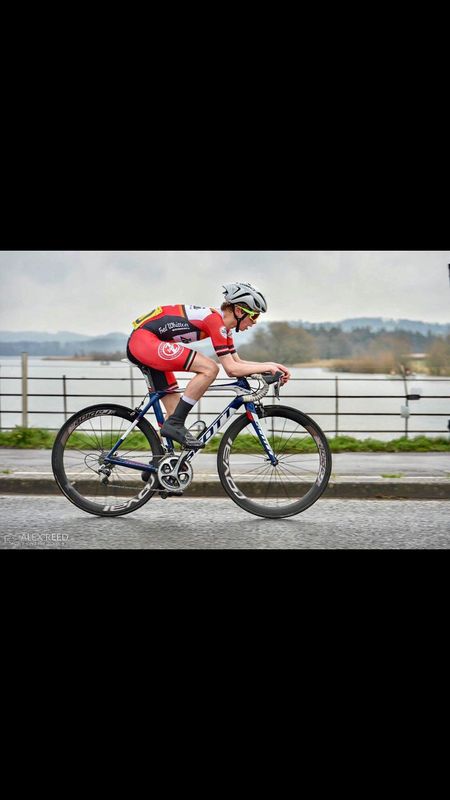 At the beginning of the season the Junior Tour of Wales was one which I wanted to win, obviously with a busy calendar sometimes you can’t go well for every race. I trained hard going into the race but picked up some illness going into the race and didn’t feel at my best which meant after having some days off before the race I didn’t have the legs that I wanted to. So I finished 4th on GC and 3rd on the Tumble Queen Stage. I left the weekend feeling disappointed but it was made better by reading a tweet saying that I had won the Series overall. Straight after the race I trained hard as I was motivated to finish the season well whilst still waiting to see if I’d got into the Worlds line up. After 2 weeks of hard training we went over to Italy for the final team race of the season. But this was not to be the last as I found out that I had made the World champs GB team. Me, Ben and Lewis all met at the airport as we would all fly out together and meet Callum once we arrived in Italy (Jamieson and Tom would not be at this race due to it only being a four rider team). Once we got on the plane we realised that Ben has drawn the short straw and that he would be sitting on his own for the flight. Once we arrived in Italy we met Callum (after he’d been waiting for a while) and Paul and Patrick drove us over to where we would be staying. We built the bikes up … eventually after losing many bolts on the grass, (not sure which muppets decided to build their bikes up in the grass) and after a scare from Callum Macloed that he forgotten to pack his seat post we set off on a recce. Luckily our hotel was on the course which meant we didn’t have to drive anywhere. We did a few laps of the finishing circuit before going back to the hotel for tea and then we were getting ready for the race. Flávio had already told us the race was going to be a fast one with lots of strong Italian and other European riders wanting good results being seen as a prep race for the Worlds but also a big race in itself. The race started fast on the flat loops with it being quite sketchy due to a big number of riders and the pace. Ben managed to get into a break away and just before the hilly finishing laps someone crashed into the back of me on a corner which meant my top three gears wouldn’t work. I got back on my bike and after a short bit of pacing back on by Flávio I reached a decent place in the convoy and was able to move back up into the bunch. I got on the back of the bunch just as we hit the climb and was able to move up. Bens breakaway was caught. There were lots of riders going out the back and a breakaway formed before I managed to make my way up to the front. I then stayed in the bunch until 1 1/2laps to go where I saw a rider sprint out of the bunch and bridge across to the break away which was 30 or so seconds up the road. I did the same and managed to get across to the now break of 8/9 after some had been dropped I the previous climb. We worked together for a few km before hitting the final climb where some attacks went up the road I was able to stay with these. This whittled the break away down another few riders. Meaning there were now 7 of us going into the final few km. The chase back on along with the hard race and not having all the gears had taken its toll and I was 6th. I was happy with this result considering the circumstances and the quality of the field. It was a great way to end the year with the team! Then there was just one race left to finish off the season! ….. The World Champs was an awesome race to be part of and a mint way to end the year. It was a fast and hard race from the gun with everyone racing to get into the first climb in a good position this meant it was also very sketchy, so after around 40/50km there was big crash which I came down in, thankfully not bad due to me landing on a bike haha which meant I was able to get back on quickly and start chasing. After a fair chase I was able to get back across to the now whittled down front group where I started to move up. Shortly after we took a right turn onto a fast decent under a motorway tunnel, there was a touch of wheels which meant another crash which I was caught up in. Getting through the carnage again it was time to start chasing hard as there was only a few KMs until the first climb of the day which was sure to split the bunch. Alfie had come down in the crash so we were able to work well together into the bottom of the climb this meant I hit the climb not too far back, around a minute, thanks to Alfie’s tows. The climb was about 10 minutes long so I knew I would have to pace the effort well but at the same time not hold much back as the race could be going away in front of me. As soon as we hit the climb there were riders everywhere which meant I was able to work my way through the riders, until I eventually made my way to the second group on the road and we were able to make our way up to the front group to make a group of around 15 riders. On the long steady downhill into the finishing circuits in Innsbruck the third group on the road was able to make contact after the Belgian team had chased hard. This made a group of 30-40 riders left in contention. On the first long climb I felt fatigued as the race and chasing back on had taken its toll on me until just over half way up when the field was ripped apart due to an attack. I just missed contact with the second group on the road which meant I was now in a group with Ben and a few others. We worked well for the remaining lap and a half until the sprint where we finished 17th and 20th I was disappointed with the result but couldn’t be too disappointed with the circumstances and racing the World’s best. It was a mega way to end the season representing GB in Austria! Thanks to Pedal Potential for their continued support. The trip started off with a very early get up before the long drive down to Folkestone for the Euro Tunnel that morning (thanks to the Dave Rayner Fund for the loan of the van). So we boarded the Tunnel and got on our way to Belgium where the racing would be starting Friday afternoon. Once we met up with the others we got our kit on and went out for a spin to loosen the legs. Once we got back we got ready for the following day. We got up and had our breakfast before setting out for a TT recce. After the recce we got back and got ready for the first stage to begin. Aubel is notoriously known as one of the toughest Junior stage races in Europe. The racing started off faster than expected with everyone fighting for position then around 50 KM in when the pace was on I was taken out which left me with an injured shoulder and hip. After straightening my handle bars and jumping back on the gap was already a big one. I chased hard hoping to be able to get back on but the racing was fully on at the front with the race now splitting. I had to keep going hard but knew I wasn’t going to make it to the front of the race. I had to keep racing in order to make the time cut and race again the next day. After finishing the race there was a quick visit to the Ambulance to get patched up and I was on my way. This was a split day starting off with a TTT (Team Time Trial) and we were hoping for a decent result as it was sure to have an impact on the GC for the guys in contention. We set off well and secured 3rd Team which was a good result as we were only a handful of seconds from the win against a lot of strong teams. The second stage was scorching hot and many bottles of ice were shoved down our backs in order to keep us cool whilst we waited for the race to begin. This race was set to be another tough one with the race starting fast and a break- away of 4 or so riders going up the road. This meant the race stayed quite fast with the break staying till the finish and me picking up 7th in the bunch sprint which gave me 11th on the stage. This was the Queen Stage and a very tough day out. It began as expected very fast with everyone wanting to get up to the front before the first climb of the day. I hit the first climb around 20th position with the pace being full on. 10 or so riders got a gap which I then jumped across to on the climb before getting caught again in the transition between the other climbs. On another of the climbs the pace was pushed on and another spilt happened with me managing to make it into the group of 12ish. The gap began to grow over the next climb before Remco managed to go clear on his own. There was a few dropping off from our bunch meaning there was now only around 9 of us left. We worked together reasonably well meaning we were not caught by the reduced peloton behind, with a few riders having team mates in the group a few attacks went which were not all followed so I rolled in 8th on the stage with only 50 or so riders finishing the stage. After a short holiday in Brittany we drove over to the Mur de Bretagne on the Friday which was about an hour away. I then met up with the others and we went for a pre-race ride, (it’s fair to say morale was high in the sun). After this we got back to where we would be staying for the next few nights and got ready for stage one which would start the following day. Following an interesting meal with unusual concoctions it was time to head back to the boat house. If it was a good nights sleep we needed this wasn’t about to happen without a few choice words to the Danes below who appeared to be in the party mood. We got up in decent time to get ready for the first stage. The stage was 110km and set off fast and was fairly sketchy with numerous crashes in the first 20km. After this a break of around 6 riders established itself off the front but it wasn’t allowed a huge gap, then just over half way into the race on a long drag I decided to bridge across to the break which was around 30 seconds up the road, but the peloton then picked up the pace meaning when I bridged it was all but back together. I decided to keep pushing and went over the top of the break as the bunch was strung out and I was away for a few km solo before getting joined by 4 strong riders, we then worked well together until getting caught 20 or so km later. Once we hit the finishing loops another little break was able to go clear and small groups kept bridging across to this meaning there were 10 or so riders up the road by this point. Coming into the closing few km the break had around 1 min 30 and the gap wasn’t going to be closed so I attacked and soloed to the finish to finish 14th on the day. Losing a bit over a minute on the day which wasn’t the best! After eating breakfast with 5 other Zombies who were struggling to open their eyes after the early start we set off on our way to the time trial. The first stage of the day was an individual TT which was around 12km I finished in 10th which I was pleased with as TTs aren’t my main focus and strength. The final stage was 97km this set off also quite quickly with it being pretty wet and technical at the beginning of the race there were a few crashes and it was quite strung out as there were a few hills with the pace kept on. Eventually a group of 10 or so riders managed to get away including Ben which meant we were not going to chase this down. After a 10km I saw the chance to try and bridge across with a few other riders who had a little gap but the bunch didn’t let the gap go so we sat up and the pace slowed so the gap quickly grew out. Coming into the finishing circuits which we would cover 5 times, the pace was kept at a decent speed with the gap slowly coming down, once we got onto the final lap and I knew the break would stay away so I decided to press on hard up the short climb into the cross wind and I managed to get a gap with Ben Tulett so we carried on working together for the next three quarters of a lap to roll in 13th and finish around 20 seconds ahead of the bunch. 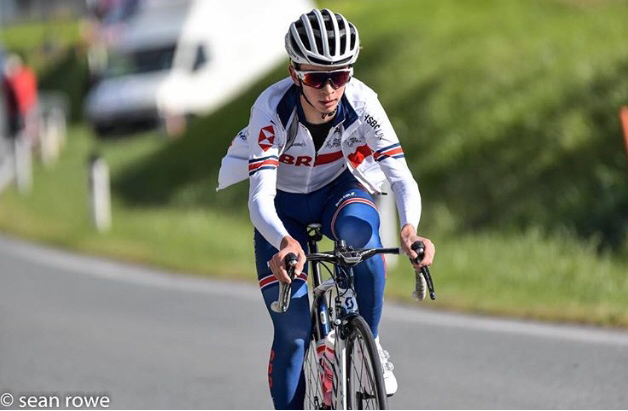 The Junior Tour of the Basque Country was a race which I wanted to do well at due to it being a race that I really enjoyed the previous year and felt that the parcours was one which suited me well. So the week started off with a fair bit of packing before the flight which was on Tuesday it was fair to say it took a while with me making sure I hadn’t forgotten anything. Once Tuesday morning came around I put my bags and bike box into my grandad’s car as he was kindly taking me to the airport. We arrived at the airport nice and early and after a short wait for Ben we went through to the departure lounge where we decided to go and get something to eat. I went for a mango smoothie and a kind of Mexican breakfast wrap which I’d definitely go for again! Ben went for an omelette which got thumbs up. After around half an hour we were joined by the other lads who had managed to track us down on Snap maps Cal and Jamieson ordered some food and Tom decided to get his packed lunch out ha ha did order a coffee though ;). Then it was time to board the flight. Somehow me, Tom and Jamieson were sat on seats next to each other having booked our own flights. This meant the flight across wasn’t bad at all as I had some dece company. Once we arrived we got our bags then set off over to Durango which was where the hotel was where we would be staying for the next 6 nights. Then it was time to get the bikes unpacked before heading off for a little spin. We got back had a shower then went down for Tea before going to bed. We got up on Wednesday morning to have breakfast then get ready to go out for a pre-race ride before the first stage which would start the following day. Once we got back we had a nice little café stop before heading over to the supermarket to see what took our fancy. Then we went back to the hotel to chill for the rest of the day. Thursday morning came around and the race didn’t start until later on in the afternoon so we had a chilled morning after a decent lie in before heading off over to the first stage. This stage was 93.3km long and included 3 categorised climbs. The stage started pretty fast with lots of attacks going, Tom attacked after one but was quickly chased down so Jamieson went over the top and was able to make the break which would stay away until the finish. Cheers to Chief bottle grabber Tom for grabbing me a bottle. I rolled in, in the bunch around a minute down. This was following a hard chase back after having a puncture at a bad time with the cars being a long way back due to the bunch being split up. Friday’s stage was 79.6km long and also included 3 categorised climbs with the biggest being in the middle. For this stage the aim was for me to get some time back on GC, the coastal roads at the beginning were a good opportunity as it was undulating along with it being technical and fast so the bunch was strung out. Ben made a break on this part with around 6 others I then saw the opportunity so soloed across to the move but as the course opened out again onto the bigger roads the peloton was able to get us in sight and close us down. After this I knew there was another good opportunity coming into the first categorised climb so Jamieson set me up well by attacking into it which strung out the group well. I kept the pace on and eventually managed to drag myself away solo before catching a rider who was up the road, I stayed on the front until the summit where I saw Harrison Wood wasn’t far behind on the decent so eased up a little which made a break of 3. We worked together well and saw a group of around 5 others coming across. So we eased up and let them get across we then worked well together, this meant we had a decent group coming into the biggest climb of the day. We stayed together with me trying to keep the group going well. Once we crested the climb the run in was quite long where we kept the pace going well, then I turned around to see Ben had bridged across the gap which was about a minute, fair play. With there now being Zappis we worked hard to keep the gap until the final climb where the pace went out of the group a little as everyone knew we had the gap to stay away. In the final few KM Ben attacked and was able to get away with one other where he rolled across the line in second, I came across the line third a few seconds back after winning the group sprint. Saturday was a day which had two stages with the first one being 69.4km with 2 categorised climbs. I remembered this stage from last year with it being the same stage as the penultimate one in 2017. It was on circuits which featured quite a tough climb which was done twice along with a steep climb up towards the finish, last year the race split with a reasonably big break getting away so I knew that there was an opportunity for the same thing to happen again. The race started with quite a few attacks going due to it being a short stage it was raced aggressively it then calmed down a little with around 30km to go. So once I hit the bottom of a non-categorised climb which was also a decent climb I attacked hard dragging away 6 or so other riders with me including Wessel who was the race leader at the time. We all worked well together on the fast run into the bottom of the final climb before Wessel attacked hard at the bottom, a few riders from the group were getting dropped so I moved up before attacking around the outside but was passed by a rider in the last 100m and rolled in second gaining around a minute on the bunch. Then the second stage was a 7km hill climb (Uphill TT). I vaguely remembered this climb as it was the final climb from the first stage the previous year. But to refresh our memories we went up there again in the car. Then it was time to get a warm up on the rollers before what was sure to be a hard effort. Then it was time to get lined up after having my gears checked and bike weighed. I started off at a good pace making sure I didn’t go too deep too early as it was going to be a long effort. I kept it going before the short decent inside the last 1km before the last little ramp up to the finish. I crossed the line with the fastest time before getting beaten by the next rider after me, so I finished second on the stage. The final stage was 88.7km and included 4 categorised climbs, this was my last chance to try for the GC as I was lying in 3rd. Once the stage began Ben went on the attack with another rider before going solo on his own, this forced the Contador team to work which was a good situation to be in, coming into the first climb Ben was caught around half way up which meant no one really wanted to take up the pace setting, so we crested the top of the climb in quite a big bunch. Then on the decent I saw the opportunity to attack, I managed to get a little gap with Wessel but we were quickly brought back. The race then slowed down again meaning Ben was able to get up the road before being caught up the next climb. I then gave it a go dragging away three others but yellow was one of them so I sat up. Another group was then able to get away containing Ben again, once we hit the bottom of the penultimate climb Cal went full gas which set me up for another attack. I went hard for a good few minutes and cresting the top of the climb I’d just caught the group of 3 containing Ben with just the yellow jersey on my wheel. We descended down the other side but with it not being technical the race was able to come back together. Cal then gave it one last try for me by setting me up again but I wasn’t able to get the gap on the leader with the slopes being fairly shallow. Coming into the finish Cal was able to get a little gap with one other where he was narrowly beaten to 2nd I lead the sprint out from around 500m out with it being a fast seated finish just one rider came past me meaning I finished the stage in 4th getting just enough points to take the win in the Points classification. Thanks to Pedal Potential and Dean Downing for the continued support. So the weekend started by driving up to Glenrothes (somewhere in Scotland), the drive was around 5 hours but wasn’t too bad as we went through the Scottish moors so the views were nice. Once we arrived it was already quite late as we didn’t set off until the evening so we pretty much unloaded some bags into the room then went to bed. The next day we woke in decent time to go and have a good breakfast. Then it was time to get the bags from the room and set off over to St Andrews where the race would be starting. After a short spin on the rollers it was time to get lined up and set off for the neutral zone. The race started and after a few little attacks which were quickly marked, the pace slowed down until 2 riders got away on the starting circuits before they were caught around 15km later. Coming into the first KOM I was positioned well so thought that I might as well go for the points and rolled across the line first. After this there were a few little attacks but nothing stuck before one rider attacked and the bunch sat up meaning the gap quickly grew out to around a minute, then another few riders went away. I then decided to attack a few times to try and get a gap but I was quickly followed so I tried to get some people to work with me to try and get the gap down a little. Then with around 15k to go I hit a proper Scottish pot hole which was basically a crator this ended in me getting a flat (3rd tub of the year)… after a quick change from the HMT car and a good tow back on, by Mark Barry, I made my way through the convoy and back to the bunch, to then find out another 3 or 4 riders had gone off the front. With no one really prepared to work I attacked a few times but they were both followed quickly so it was then just a case of riding into the bottom of the final climb to see what I could do. I decided to limit my losses so I attacked as soon as we hit the climb. After a little glance around I found that I had a bit of a gap so carried on pushing hard to the top of the climb getting a few break away riders now in sight, once I caught a couple I crossed the line in 4th not the result I wanted but it could’ve been worse. The gap to first was around 2 minutes so I had my work cut out to get this back on the following stage but was going to give it a go. After a nice Italian, where Joe couldn’t hack the spice, we headed back to the hotel for an early night. I woke up the following morning and had my breakfast before heading off over to the start of the stage 2. This stage had 3 decent climbs in it but was a flat run into the finish. The stage started off with people trying to get in breaks and with the Spokes team controlling the race once we hit the first climb I attacked at the bottom and managed to get away with one other meaning I took the KOM points. We kept going over the top but were brought back a KM or so down the road. Not much happened until the next climb where I attacked again getting the KOM points then carried on over the top before being caught a few km down the line. After this a few attacks went but the race was still controlled until 3 went up the road containing the ‘Road captain’ aka Lewis (well he thinks he is anyway). So the gap was allowed to go out to around a minute coming into the final climb, Lewis was then distanced by the break which meant I attacked to see if I could gain any time and get up to the leaders but was followed by the rest of the bunch coming into the long final run in to the finish. No one was willing to work meaning the gap to the two leaders hovered the same and they stayed away meaning I slipped down to 6th on GC and finished in the bunch. At the end of the weekend I finished 6th and won the KOM competition. The weekend started with a quick trip on Saturday morning going over to see how Darren and Graeme were going on with the ‘Neverest challenge’ where they were kindly raising money for my cycling (thanks a lot guys, much appreciated). Then we started the trip down to Wales. Once we got into Monmouthshire we went over to find the course where the little loops were. I got changed and went to do a loop or two with Joe and Sam. Once I got back we headed back over to the hotel to get changed before heading out for a meal. After some nice, slow service and being full after the lasagne and a course of the general ‘banter’ we drove back to the hotel and got ready for bed as it was knocking on by this time… the people in the hotel had clearly lost the plot when the fire alarm went off literally just as my head hit the pillow. Then it was time for a nice catch up in the carpark with half of the field that would be racing the following day. Once we were allowed back in I went to bed ready for the next day. So the morning started with a trip over to breakfast to have some proper get round food. I’m not saying what I had but one clue is you wouldn’t expect to be having it for breakfast. Once we went back to the room to get the bags we set off over to the HQ ready for sign on. I met up with the rest of the team then we went to get signed on. When we were signing on we saw 1 set of numbers where one was normal sized and the other big enough to cover my whole back, yeh you’ve guessed they were mine, at least the others had a good laugh out of it ;) after some pro folding skills (basically origami) I went on the rollers for a little bit before it was time to line up. Once we set off there was a few KM of neural before the flag dropped. A few attacks went but nothing stuck due to there being such a fast section on the dual carriage way which was a bit sketchy to say the least. Once we got off it there was a big crash, I somehow managed to avoid a flying bike. Soon after this 4 riders went up the road including my team mate Callum, who was riding for central for the weekend. The bunch knew it was a strong group so the gap was only allowed out to around a minute where it hovered for a while. Coming onto the finishing circuits the gap had come down a little to the leaders. A few of us tried to push on in the reduced bunch but we were followed so the race sat up a little until the next climb where the race went hard again, this is where we made contact with the leaders. The race then eased up a little which meant another break of 3 or so riders went up the road with Callum in. With a few laps to go the pace was kept on in the bunch so the gap was only allowed to grow out to around 40-50 seconds, coming into the final lap I knew the gap had to be closed soon so I attacked just after the finish line bringing 5 or so others with me as the road still dragged up towards the top end of the course. I stayed on the front going hard as I didn’t want to risk the group coming back together, once we hit the next climb the group was working reasonably well together as we now had the 3 leaders in sight. We caught them up the climb meaning there was now a group of 9 of us but not knowing what the lead was back to the other group I tried to keep the group working as there were a few attacks going. We stayed together into the bottom of the final climb and I waited until 300m to go before launching my attack, thankfully no one else was able to get back up to me so I crossed the line with the win by a few seconds. I was really happy to get my first Junior National series win and it put me into the lead of the National series! 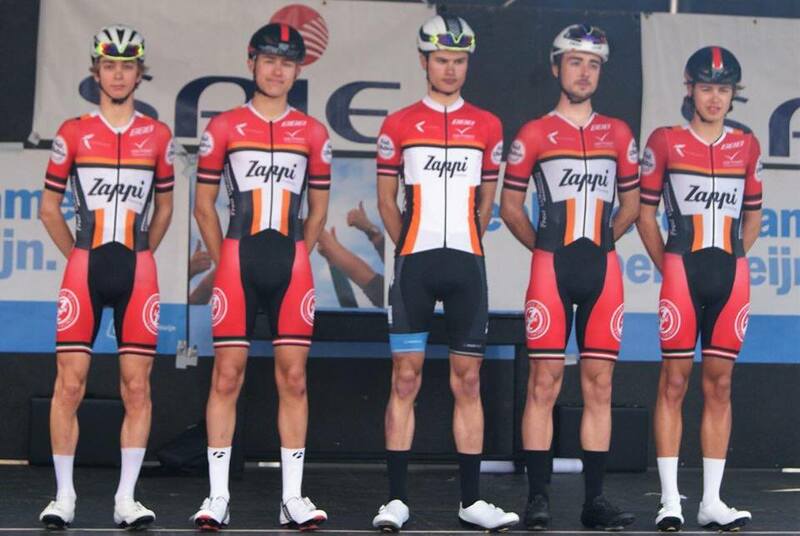 I’m now looking forward to Junior Tour of the Basque country in a few days time. Thanks to Pedal Potential, Dean Downing and Darren for the continued support. On the 16th May I travelled to the prestigious, fast and furious Junior Tour of Axel picking up Ollie Rees along the way who would be guesting for us for the weekend. This meant the team was me, Lewis Hartley, Ben Healy and Callum Macleod and Ollie Rees. We set off Thursday afternoon in a van kindly leant to us by Neil Hendry (thanks for that Neil). In the aim to get to Folkestone where we’d be staying for the night for 10pm. After a few stops for a bite to eat we got there in good time unloading the bikes and putting them in the room before we all met up for a session of banter before bed. We woke up in good time ready to catch the train as we were racing that afternoon. Once we got to the tunnel we were told there would be two hour delays which would have meant us probably missing signing on. Thankfully Jed managed to sweet talk his way onto the crossing this meant we arrived on time in Axel ready for a recce around the TT course. After getting a bit lost (I’m not going to name any names) we arrived back at the carpark and went to go and find somewhere to eat. I thought I’d break the usual continental mould and have a tuna salad baguette. Then it was time to go and get ready for the race. After being warned by Jed that the race was going to be sketchy and fast we knew we were in for a hard few days. For a bit of background info on the race … this was a UCI 2.1 race comprising of a flat 105.6 KM Road stage, which included a few cobbled sectors, an individual time trial which was 12.2 Km and on the same day as the time trial there was another road stage of 102.8 KM, this was also a flat stage with a longer cobbled sector. On the final day there was a grippy 99.9 KM road stage which included some bergs and a section of cobbles which was a few KM and ended just before the finish. With a total of 320.5 KM in distance this was set to be a good weekend of racing. The race went on the infamous Paddestraat cobbled sector. Back to the race Stage 1 was a fast race with a 175 riders starting and a lot of crashes. It started with a nice and sketchy neutral section then once the flag dropped the race started fast with some of the teams already starting to control the race. I managed to stay in a decent position safely in the bunch (or not so safely). And coming into the finish I moved up a bit more to keep myself out of trouble and rolled in around 50th. After the race we quickly got changed and went off to the Youth Hostel for something to eat. Closely followed by bed. The morning started quite early again with us going down for breakfast, porridge of course with a nice helping of honey or for Callum half a tub of Nutella. Then it was time to set off for the race ready for the Time trial. Once we arrived it was time to go and line up and make sure the bikes were UCI legal. After this we started to warm up and with me not going off for a while I chilled out. So the stage was a flat time trial with a few twists and cobbles on the way which was sure to shake up the GC. Ben put in a strong performance coming away with 6th with me rolling in 27th place. Then it was time to try and recover before the road stage. We went for a nice meal in a restaurant near the start for the usual Spaghetti Bolognaise. The stage started off similar to the first one. The race mostly stayed together until Ben attacked a bit put from the finish and managed to stay away taking the win. I managed to finish safely in the bunch with the rest of the lads good ride also by Ollie to get back on after puncturing close to the finish. Then it was time to quickly get changed and set off back to the hostel. Then it was the usual eat, sleep and repeat. The eagerly awaited stage 4 (Queen Stage), it was a twisty, narrow and cobbled hilly course which made it difficult riding, for at this point about 150 riders. The race started quickly with lots of riders going out the back due to the ferociousness of the racing. On a fast decent coming into one of the tight corners some of the riders (including me) mis-judged how tight it was meaning that I went flying into a field losing my bike somewhere in the long grass, with Ben also coming down in the process and Cal stopping to make sure we were alright those two quickly set off to get back on, with the cars still behind some of the dropped riders it was a while before our team car arrived my dad quickly got out of the car and helped me retrieve my bike and quickly banged it back into place. After eventually setting off after a good few minutes my chase was sure to be a hard one. After around 20 KM I managed to get back across to the depleted Peleton. The race stayed more or less together until 35 KM from the finish Callum managed to get away with 6 others and they quickly got the gap out to around 40 seconds. They worked well together and with around 10 KM to go I noticed some tired legs back in the bunch and decided to try and bridge across to the break-away group on one of the climbs. After a few KMs of chasing there were now both myself and Callum in the leading group with a gap of 50 seconds to the Peleton. Callum and I carried on working hard trying to draw the group further clear with some riders now sitting on due to us being the only two riders both on the same team. After the hard cobbled sector I came in 2nd, 1 second behind the winner with Callum close behind in 4th. This now meant that I was 3rd on GC with Ben 7th and Callum 10th. At the end of the weekends racing only 72 riders crossed the finish line. A great result from the Team winning the Team prize from some of the best Junior Teams out there. Previous winners of the race are Danny Van Poppel and Adam Blyth. With Tom Boonen once finishing in 3rd. All in all a great weekend of racing and a fantastic experience against riders from America (National Team), Switzerland (National Team), Belgium, Holland, England, Scotland, Italy, Denmark, Norway, Bermuda and France. I would like to thank all of our Sponsors for their continuing support. Pedal Potential, KCA and Dean Downing for the coaching. Before the weekend started it was a case of an FPT test the day before the Crit. Most people would say it isn’t their favourite activation before a race but I always look on the bright side and just thought that my legs would be nice and activated for the Crit even if there was some pain. Saturday started with a chilled morning giving my bike a clean before heading out over to York. After picking up Jordan in some decent weather we got to York where we went and signed on and got changed. Following that it was time to get on the rollers. After one of the team mechanics (aka dad), over oiling the chain this meant that my fresh white socks now had a Dalmatian pattern to them, (teach me to do it myself next time)! It was then time for a few laps of the course trying to remember how to take the corners as I hadn’t raced there in a year. The race started quite quickly with a lot of attacks going. I stayed up there in the top few trying to get in some breaks of my own. After going too far back in the bunch I missed two riders that went up the road who quickly gained a quick lead. Then another few went up the road, I then knew I had to get onto them. Coming round the hairpin bend there was a long straight which curved round to the start finish so I went hard into the cross wind getting me and Matt Taylor off the front. After a few turns me and Matt quickly got up to the second two riders with the first two still up the road. Then Jake Womersley got across meaning there were five of us. We worked quite well together but weren’t going full on which meant the two up the road stayed there and as it got a bit cagey coming onto the last few laps the win was all but gone. So my efforts were then focussed onto the podium. Coming into the last half a lap I attacked the group I was in and was quickly followed but having a few bike lengths I kept pushing and the gap grew out coming into the head wind section so I came through to take 3rd. I was happy with this in an E123 Crit. Good event put on by 3RT. Thanks. This started with some travelling down to Folkestone on the Thursday with my Dad and Danny Marsden who would be helping with the long drive to Troyes and the mechanicing for the weekend. On the way down to Folkestone we picked up Callum and Angus at the services then carried on the journey. Once we got to Folkestone it was quite late. So we took the bikes out of the van and took them up into the room. After meeting up with the others we went to bed. It was an early get up on Friday morning, we got straight up, we loaded the cars and van before setting off to the tunnel. It all went pretty smoothly. Once we got to Calais we started the drive down to Troyes, where we would be staying for a few days. Once we got there we dropped the bags off in the room and got ready for a little pre-race spin on the bikes. The terrain was rolling and it was very windy. Following this we got back, changed and then went over to the canteen for tea. It felt like a throwback to school with school meals the only difference was it was French style. After this we had a chill and went to bed. Not having to get up too early the next morning we went and got breakfast and then packed our bags for the stage which was in the afternoon. Still a bit full from breakfast we went back to the canteen for some lunch, (supplied by the race organisers). Then it was time to set off and get ready for sign on, on the stage for the Team presentation. Then we went for a little ride before lining up for the start of the race. The neutral was sketchy to say the least which ended in me getting a flat after going down a pot hole. With the car positioned very far back it meant a long wait but after a decent change (with the need to get the chain back on) I made my way back to the convoy and worked my way through it. Once the race began so did the rain and with a bit of cross wind a few teams put it in the gutter which meant the bunch strung out a little. I managed to work my way up to a decent enough place in the bunch then once we turned onto a narrow country road and there was a cross wind everyone wanted the left hand side of the road which meant there was a crash ending up with me in a French ditch…soft landing at least. After some guy eventually decided to get off my bike it was time to get chasing. (A good start to the race being only 30K in at this point). Once I got on my bike I made my way up to a group of around 10 riders then coming up to the first KOM of the race I went past them hard and just over the crest of the hill made my way up to another group of around 15. With the bunch now in sight but the pace not really letting up I managed to make it into the few cars that had got past the carnage. Then I got back on. After that I thought it would be a good idea to have something to eat and the minute I decided to stick my hand in my pocket some guys decided to have a lie down on the floor. Thankfully I managed to avoid it. A few K’s down the line I was feeling good so coming into a cross wind section I went hard stringing out the group and causing a few splits at the front. Then realising Ben was also up there he attacked once we slowed down a little and then it was just a case of following moves while he was out front solo. Unfortunately Ben got caught around 10 Km’s from the finish so it was just trying to get into a good position for the last climb. On the last climb I didn’t want to leave it to the sprint so with about 3 Km’s to go I attacked 3 times not managing to get off the front which meant it was going to be a bunch finish. In the end I finished in the bunch. Day 2 started early with some porridge pots and a bowl of coffee (the French cups are tiny). After this we quickly went and set off to get ready for the time trial. The first thing we did was get the time trial bikes checked and thankfully there were no problems. This meant we had plenty of time to get changed and have a good warm up ready to leave everything out on the road. The TT started well with Ben getting us up to speed nice and quickly with me taking over after him and we all worked really well together with 5 of us finishing out of 6. Finishing 3rd on the TTT, less than half a second behind 2nd place. This meant we all had decent positions now on GC with 4 of us in the top 15. Going into the road stage which was a bit hillier than the previous day I was hoping it would split up on the climbs so coming into the bottom of the first real climb I got away with Dylan Hughes and a few French lads but the gap didn’t go out too much and we were caught after around 20 Km’s. After than not too much happened with a few attacks going but nothing was allowed away due to a team controlling it well on the front. In the end I finished 15th on GC, joint on time with 7th and 2nd in the KOM competition. This was a ride which I looked forward to with it being the Teams main sponsor. Saturday morning started with a little ride before heading over to the Lake District. Once we got there we were a bit early for sign on so my brother and dad who were camping went over to pitch the tent at a local campsite and I pretended to help. After a quick tent put up we went over to Grasmere to meet the guys and sign on. Once we all found each other we went inside to sign on realising that Callum didn’t know what order numbers go in and somehow loosing Jameson in the process. Then it was time to head off back to the Hostel this is where Ben, Callum, Jameson and Tom went for a ride (Henry Hollyman too), leaving me and Lewis to mess around on the bikes. A few Supermans later and it was time for tea hoping that the portions were going to be huge to get us round next day when the lasagne came it was nice but too small for our liking so after great confusion from the people serving Jed managed to get us another portion each which just about filled the space with a dessert. After this it was time to check the bikes were all good and put the numbers on sportive style. Then we got ready for a very early morning and then went to bed. Then beep beep ...well Sunday morning was here …might as well have still been Saturday night. 4.25am the alarms rang. I drew the short straw being first out of bed meaning I had to walk like a Zombie to the other side of the room to switch the light on. We opened the curtains to our disgust at some drizzle and cold which was a bit of a moral slash to say the least. Then we got our cycling kit on and walked down to breakfast. I went all out on the carbs with 2 porridge pots and a bag of rice which I was defeated by and decided to shove it in my back pocket for the ride down to the start. Once we were on the start line at 6am a few photos were taken before we led out the Fred Whitton challenge. We started off with the 6 of us riding in pairs before a fair press on up Kirkstone pass and then heading over to Honister Pass where the feed would be down the valley after it. After waiting for a bit at the feed to re-group we set off again together with a rude awakening straight up Newlands Pass then down the winding road down towards the next climb which would be Whinlatter, this is where we saw Jed at the bottom. WE then carried on at Whinlatter and then headed over towards the Moors with a nice view of the sea, Jameson got a flat and realising he didn’t have a clue how to use a gas canister I lent him my pump and we quickly got back on our way over to the big one Hardknott Pass. Well… that was a stinger. Then we carried on over to Wrynose Pass which was the last one of the big climbs but not the last climb. After the decent it was a case of one last kicker (Bleach Tarn). Then it was just about 10Km’s to the finish where we finished ourselves off with a Team Time Trial on some tired legs. It was a good hard ride finished off with some pie and peas and a few hours journey home. Thanks to Pedal Potential, KCA and Dean Downing for your continued support! Looking forward to Axel this weekend! This was a race that I was looking forward to due to the hilly parkour on the final stage which I enjoyed last year in a painful kind of way. So the weekend started with an early get up on Friday morning to get the car packed and set off on our drive down. This time I was organised and packed my earphones hoping to drown out dad’s music. Unfortunately, it turns out the car radio is a lot louder than my phone! After the journey we arrived at Cheddar where we parked up and set off to recce the course. Later on after the ride we arrived back in Cheddar and went out to find some food for tea. I went all out and decided to go for a chicken skewer and chilli which was decent. After this we set off to the Youth Hostel where we would be staying for the next few days where I met Tom and Lewis, (Lewis arrived first to make sure he got the bed of his choice) after this Lewis went out for tea leaving me and Tom to our own devices. So once unpacked we headed over to Gainsbury’s for some snacks. When we were in there we got a phone call from Lewis asking where we were due to us locking him out of the room. So we headed back to our room and waited for Ben to arrive. When he arrived we chilled out and went to bed. Saturday morning we woke up nice and early where we went down to breakfast to find Chef Jed making us porridge and omelettes, which were nice and would set us up for the race. So the racing started off with a 4.2KM Prologue which would head out past the Chew Valley Lake I finished 9th on this which I was happy with considering it isn’t my speciality and it was won by Team mate Ben. After this it was time to get something to eat and get changed ready for Stage 2 in the afternoon. So after a few KM of neutralised the race set off. Straight out of the neutral it was the Stage 2 finishing climb which was nice to warm up the legs after the Prologue ;). After a rider got away at the bottom of the hill I crossed the line for the KOM points in 2nd with Lewis 3rd then the race slowed down allowing it all to come back together. Once we were onto the loops, attacks started to go and the first one got up to about 40 seconds roughly half way through the race. With Ben in the jersey I went hard through the feed zone climb forcing me and Ben off the front which meant we were able to bridge to the break quickly but we were followed closely by the bunch so it was all back together after a few KM’s. A few KM’s down the line another break away went containing some strong riders and with the bunch not really working the gap was out to nearly 2 minutes with just over a lap to go so I got on the front to help Ben with some pulling and with the help of a few others including Ben we were able to get the gap down to 17 seconds at the end. Good ride by the guys in the break. After the finish we had our recovery drinks and headed on the long decent down Cheddar Gorge back to the Hostel where we got showered and changed and ready for Elaine’s Spag Bol…just what we needed after a hard race, thank you! Later on we had a walk back over to the Supermarket for a few more snacks which gave us all plenty of morale. Then it was time to chill and get ready for bed before the hilly stage the next day. Sunday morning we woke up bright and early for Jed’s speciality…much appreciated. Then we packed up and set off on our way to HQ. Once we arrived at HQ we got signed on and ready for the stage. Then we went to the pre-race rider briefing where I was putting oil on my legs, eating and listening to the commissaries. Once we’d done this we got lined up ready to start the neutralised. When the flag dropped the race started and quickly got underway with attacks going. Once we got to the foot of the first climb (Burrington Combe) a few riders went up the road and with the bunch not responding the gaps went out quickly, then a few KM’s out from the summit Lewis attacked where I followed and once I got onto his wheel I realised we had a little gap so I went round him and went hard. Then we were caught by the group led by Oscar over the top but I stayed on the front to pick up 2nd on the KOM. Then when the race slowed up no one in the bunch wanted to take up the chase which meant the attacks went up the road quickly and with the long flat run in to the 2nd hill which was the Blagdon climb the gap was around 2 minutes going into the bottom of it. The race was quickly lit up in the bunch by Ben right at the bottom which was then carried on by Oscar up through the feed. Once we reached the top bit of the climb where the gradient ramped up again I decided to keep pushing on with my legs feeling good. I had a gap of around 15 to 20 seconds and my only option was to keep going hard hoping that I would either get across to the break or be caught by a select group. After around a KM I saw that the largely reduced bunch was working well together so I eased up and waited for them to catch me. Just over 10 of us were doing a chain gang but we weren’t going quick enough and were caught by another big bunch of riders which took the momentum out of the chase. With the breakaway at around 20 seconds up the road the gap then grew to over 40 seconds at the bottom of the final climb which was Harptree Hill. The pace was slow at the bottom with no one wanting to take up the charge, the pace was then picked up by Oscar, after this I stuck it in the big ring and attacked not looking back until I got to the finish line, finishing 5 seconds ahead of the next riders. Not quite the weekend that I wanted but with Ben getting a stage win, Zappis winning the team prize and me winning the KOM competition and 3 of the team in the top 10 on GC …wasn’t too shabby. I was at home for the weekend and decided to enter a local TT. It was the Otley 10 on the Walshford course which is a rolling course. It started in the afternoon so it meant we had a chilled morning before setting off on our way. Once we arrived me and Henry went out for a ride on the course and signed on once we got back. After this we got our numbers pinned on and had a quick go on the rollers before starting the TT. I started the TT hard hoping the legs would feel good after quite a hard few days of training. Once I got to the turn I had caught a few riders so knew the legs were feeling pretty good. On the return leg I went full gas on the final few rises and finished in a time of 21.02. Which gave me 2nd overall and 1st Junior. I was happy with this and it gives me confidence going into the stage races which include TT’s. Big thanks to Dean Downing for his coaching over the last few months which has definitely improved my time trialling. Also big thanks to KCA for the support. After the TT I rode home with Joe (Howcroft) where I would be staying at his house for the night. After a nice tea out (thanks Kate and Tim) we went back and watched some TV before going to bed. We woke up in good time on Sunday morning to get a good ride in on the Horsehouses loop which would go into the Yorkshire Dales. After a fair press on we got round the 143KM loop in 4 hours and ¾ hours. A good end to the week! Thanks to Pedal Potential for the continued support and Alex Reed for the photos. I woke up that morning looking forward to seeing what the Clayton Spring Classic had to offer. It was a cold morning 3-4 degrees so I was sure that after the early get up the cold would wake me up. I had my breakfast, packed the car and we set off. After 1½ hours of Dad’s disappointing music (BBC Radio 2) we arrived at HQ. Then it was time to sign on and get ready. Forgot how much of a minefield choosing what kit to put on when it’s cold was. Once I decided what I was wearing it was time to get changed and pin my number on. Then it was time to get warming up whilst eating rice and drinking coffee and they say men can’t multi-task! Then time for one last toilet break before the briefing and rolling out to the start. After a short ride to the start line it was time to get into groups where I started in the middle group of three joining the other 1st and 2nd Cat Juniors and the 2nd cat men. As soon as the race started I went off hard trying to get the speed up quickly in a hope the group would work together well. After a good first half lap of chain gang over half of the group thought it would be a good idea to save their energy so the impetus had gone. A few of us were still tapping it through but we weren’t going at a fast enough speed. Two groups of three then manage to get off the front of my group so I tried to start a chase but there weren’t enough riders wanting to work so then I decided to try and save some energy waiting for the scratch group to catch us. Once they caught us the pace was evidently faster. We then caught the front main group but didn’t catch a few riders who managed to stay away from the first group. As the people in the scratch group began to stop working together I attacked getting across to a group of 5 of the scratch riders who managed to get off to the front a few laps prior with the scratch group now chasing again I knew I had to keep pushing on and so straight away started working with the riders before putting in 1 last effort up the last drag around 1 KM from the finish. Just 1 rider managed to come round me in the sprint from the group that I had caught. I then finished 9th. The first Belgium Race was Zepperen Zepperen. This would be quite a typical Belgium race being flat with a few little bergs. It started with a quick turbo session on Thursday morning before setting off on our way to pick Ollie (Rees) up, who would be guesting for Zappis for the weekend. Due to the snowy weather we thought it would be good to set off early as the weather decided it wanted to make it difficult for us. After picking Ollie up we set off on our way to Lewis’s in the hope we’d get there before midnight. We arrived at Lewis’s after 3 ½ hours of travelling on a journey that should normally take 1 ½ hours. After arriving at Lewis’s we went straight for a session on the Tour de France game before a traditional Lancashire tea, kindly cooked by Elaine. Then it was time for a chill then bed. Friday morning we woke up in decent time ready for a group roller and turbo session to spin our legs out before the long journey down to Folkestone sure to be made longer by the weather. Eventually we got down to Folkestone after a lot of traffic and slow journey due to the snow, a decent 7 ½ hours in the car and a nice numb bum to finish. We arrived at the hotel, brought our bikes and bags up to the rooms and decided to get out for tea. After Lewis assuring me and Ollie that the Peri Peri chicken was ‘Peng’ us three all decided to go for it and it lived up to expectations. Then it was time to get back for a quick turbo session to wake up the legs after the journey and then bed. We woke up the next day, went down for breakfast and set off on our way to the terminal before getting on the channel tunnel. Once we got to France we drove for 40 or so minutes before stopping at a services for something to eat. Then we set off on our way to the course ready for a recce. After this we set off to find the hostel. Fraser, Chris and Jed had been busy making tea. Us lads showered and got changed ready for tea. Cheers dads! Then it was time to get ready and go to bed. We woke up the next morning to breakfast then we got our kit ready and came down for an early lunch. Then we were off to the race. A good few laughs later we arrived to start pinning the numbers on our bikes and getting ready. A warm up down the street came before the race. After a hectic neutral zone thanks to some Belgian choppers the race started. Due to being lined up quite close to the back I had to make my way up to the front of the bunch before attacking around 35KM out from the finish where I was joined by Ollie with it being quite a fast part of the race with no real wind the bunch weren’t allowing us to get away and after 10KM up the road the bunch caught us. After this we went back into the bunch as we were onto the finish laps. With there still being a lot of riders left, the run in was pretty sketchy and this didn’t give us much chance of moving back up. This meant we weren’t able to move up very far and in the sprint there was a crash which caused me to come down. Thankfully it wasn’t too bad just a few cuts and bruises which would make the journey home longer than it already was. Thanks to Callum for carrying my bike, much appreciated. Then it was time to get packed up and start our journey home. First trip to Belgium finished. Thanks to Jed for the journey and Alistair for the final leg. So the second trip to Belgium began with me and my dad heading down south on Friday lunch time to some services near Leister to pick up Paul Whitton who would be helping the team for the weekend, big thanks to Paul for this! Once we picked Paul up we set straight off down to Folkstone where we would be crossing over to Calais later on that evening. We planned to meet the rest of the lads at the Euro tunnel as we were booked on for the same crossing but it turned out they needed to put their make up on which meant they were running late. Due to us being early we stopped at the Euro tunnel before boarding at ‘Leons.’ I went for the Sicilian chicken meatballs and a chicken and chorizo wrap which were nice. Once we boarded the tunnel we were told the rest of them wouldn’t be making the crossing so they would be coming over later. Once we got across to the other side we began to head over to Belgium to the Focus Hotel/hostel where we would be staying for the night. Once I got settled I waited for the lads to arrive by this time it was quite late so we got straight to bed. The next morning we woke up to a proper Belgian breakfast and then we got on our way to drive round the course as the race didn’t start until the early afternoon. Once we arrived at HQ we parked up and went to find something to eat. Luckily we found a nice café where we had spaghetti. After this we went back to get changed and get our numbers pinned on. Then it was time for the team presentation and time to line up. Once we were lined up the weather seemed to be coming in so I decided to put on another layer which it’s fair to say I was glad about. After the typical Belgium neutralised (big crash) the race started into a headwind then it turned onto a narrow section where it strung out a bit more. After some cobbles the race began to thin down a little and coming into the small circuits the bunch was definitely smaller. Coming into the Nokere berg I realised a few riders were around 20 seconds up the road so I decided to try and bridge across to them, after a bit of top tube pedalling I made my way across which made 3 of us with another 2 then getting across there were now 5 and the peloton wasn’t going to let this up the road so after a few more kms were we caught. The race stayed on after this for around 10km before another lull in the race gave me another opportunity to try and get away but with no one else following and there still being a big group left there was no getting away. Once I was caught there was a crash which meant the race was split a lot and no one who was caught behind it made their way to the front again due to the pace staying on. This was now my race over and once we got to the finish line with 1 lap to go we were pulled out. I was disappointed but happy with how the legs were going into Guido the next weekend. Wi-Fi then went off to bed. After a good sleep we woke up and had something to eat before packing up our bags and getting our kit sorted. Then it was time for some pasta and to set off to the race. Once we got there we got the numbers on and got changed fair to say it’s a mind field what to put on when it’s as cold as that. Once we got to the start line we set off and started the neutralised section, at the end of this the race was stopped then started again. Straight from the off the race was on in the cross winds and the chesty cough I hoped would be alright for the race wasn’t feeling good so after 40 or so km I decided it would be best to pull out to make sure it wouldn’t get any worse. This was disappointing but I knew it would be better than having weeks off later on. After this we got changed and packed up then we set off back home. So the weekend began with a drive down to Wales with my mum and dad to a place called Glasbury where me, Ben and Jameson would be staying. Once we arrived I went up to the room to find out that Ben had shot gunned the double bed and Jameson had shot gunned the single leaving me on the temporary bed! Teach me for being late. Then it was time for me to quickly get changed and out the door for the course recce…somehow managing to lose my banana in transit. Once we had done a few laps we arrived back at the B & B. Then got showered and changed before giving our bikes a quick clean over. After recovering from the mucky Welsh roads. Following this we chilled for a bit before heading down for tea. I went for the Hake with mussels along with Ben it was a proud moment witnessing Ben’s first try at mussels. After this we went back up to the room and chilled for a bit before going to bed remembering that we had an hours less sleep. 8am… the morning started with the usual alarm we had 15 minutes to get ready and down to breakfast. Porridge it was possibly the biggest bowl of porridge I’ve ever had then it was time to get the cycling kit on ready to ride over to sign on. After the usual queue for the toilet we set off over to the sign on. After a bit of a catch up it was time to sign on and get ready. It wouldn’t be a race without another trip to the toilet. Then we had the rider briefing followed by some keen cyclists running to the start line. One the neutral started I made my way through the maze up to a decent place in the bunch. Then the race started and a few attacks went with a group of 6 riders who managed to get a gap off the front which soon grew out to a few minutes due to the bunch not working together and I knew then I needed to try and get away so I managed to get a gap and pushed on hoping some riders would get across to me thankfully after a lap solo a group of about 5 riders caught me and we worked well together slowly bringing the gap down to the break coming into the last lap we were told 1 mon 20 knowing we still had a chance if the group in front messed around. With half a lap to go I did the usual shoe tightening which I regretted at the end. Coming into the bottom of the last climb we saw the group in front and I had a dig pretty much as soon as the climb started trying to catch them. Once I got to the top of the steeper part I got cramp in my foot meaning that I was struggling to push on the pedals, still feeling that I had some legs left. Giving me 7th in the end. Positives to take from the race my legs were definitely there… looking forward to the Mendips in just under two weeks time. Big thanks to Paul and Diane Quarterman for the weekend and the parents for helping. Sad not to see Euan Cameron there after a bad crash in training. Hope you heal quick. Also unlucky Ollie Rees for crashing in the race speedy recovery. Thanks to Pedal Potential for your continued support! Great training in Spain, big thank you to CHS for your mint hospitality. 3am...they all say good holidays start with an early get up! That's what got me out of bed anyway. I had something to eat and packed the car and we were off to the airport. Most of the journey to the airport was filled with me wondering what I would have forgotten when I reached Spain but I knew as long as I had my bike I'd be okay. Once we arrived at the airport I met up with Ben and Lewis and we checked in. Then it was time for the security check ...Lewis looking like the fishy character that he is had his bag checked and with the last call for our gate ringing in our ears it was time to get running. When we had finally made our way to the gate we soon boarded the plane. Adios! Once we arrived on the Spanish tarmac it was time to make our way through the airport to find our lift. After a good laugh on the escalator (and Ben realising that his Bike Box will not fit through every space) we arrived at the van. It was at the vans when Lewis realised 'shot gun' doesn't always work. We got on the road for an hour long journey over to Callosa d'en sarria (or near enough). At the camp Nozad and Jubi were very welcoming serving a proper Spanish lunch to set us up for the first ride. Then it was time to quickly set the bikes up and get our kit on ready to get off for our first ride. We had a short 2 hour ride where we familiarised ourselves with the area. It was a nice simple route up to Guadalest (a town on a mountain) and back. With everyone in search of some morale as the ramp started so did the hurt. The downhill home was much easier. After this we got showered and changed ready for tea. The 3 course meal was much appreciated followed by a course of banter and then it was bed. Waking up to some decent looking weather was a nice change. Then it was down for breakfast...porridge followed by 2 poached eggs on toast. Next we got our kit on and went out on our bikes. 7 of us made the journey up into the mountains. Cheers Chris for the class route, going over some big climbs and up the well know Col de Rates and back to base. Followed by the same routine as Saturday.....it was time for the sauna, tea (3 courses of course) and then sleep. After a good nights sleep and breakfast we met up with Flavio and the under 23's. Out and back to Tudons with a bit of Team Time Trial in between which was nice and grippy. Accompanied by some rain. Unfortunately Jake crashed on the slippy Spanish roads and broke his elbow, (heal quick mate). Then it was time to leave the under 23's and make our way home, cheers Flavio for the ride. No need to say what happened next as you've already established our evening routine. Another good day in the saddle. Some roads still a little wet from yesterday's rain (so basically an ice rink). After descending Tarbena at the end of our big loop we received a phone call from Callum to say he'd been knocked off by a car. The good team mates we are ;-) we rode back up the hill to make sure he was alright. After this we rode down to a Caf and with our eyes being bigger than our bellies we ordered half the menu. Feeling refuelled and fat we started the ride back to camp featuring a dirty hill known as 'red road.' Once we arrived back it was sauna, eat, sleep, repeat. Today was our rest day (easy day). Caf and back day. Today was the day when we had to find the well known Origen Caf. After a successful Caf hunt we tucked into our meals. Definitely worth the find. Straight after eating we were onto the beach for a proper rest day chill. Then it was time for a cruise back up the hill. You guessed it ...same again, (routines and that). Back on the hard days it was a loop round over Tudons and back over Guadalest and down to our favourite Caf to finish off the ride. Since the sun was out we soaked up a few rays with Lewis and Callum having a competition of who could tan the best. The rest of us managed to improve our tan lines. Followed by the usual. This was set to be the longest ride of the camp where we headed through Calpe and over to the Cumbre Del Sol, ( finish of stage 9 of the Vuelta 2016). After a nice effort up there it was time to do what Tourists do best and take a few photos. Then it was back down and on to the rest of the ride. Trying out some different roads for a bit of fun this ended up taking us onto a few drive ways before heading back up the Col De Rates. Then it was time to drop down back to our favourite Café where we had quickly become regulars. After another good refuelling session we headed back and once again started our evening routine. This was our last day on the bikes and it was time to have one last blast. We did the same route as Thursday which was a fun route to finish off with and why not finish off with a trip to the sweet shop at the top of Guadalest and back to the Caf (they're gonna miss us). Followed by one last ride up to Callosa. And onto the last night...what better way to spend it than the same routine followed by a trip into the Town for the night. Morale was low as we knew the English sun (rain) was awaiting us. Then it was time to pack our bags and say our goodbyes. A big thanks to the guys at CHS for a great week. And to the lads for some good company and banter.